Quick Base lets you show or hide selected screen elements from certain user roles. You can also limit the ability to edit multiple records, and hide report customization and creation options from user roles. Note: When you customize the user interface for different roles, the access permission to information within your application does not change. If you need to secure information, you must set access controls for different roles. When you customize the user interface, it merely hides or displays different elements on the screen. Tip: As you configure screens for different roles, you can test them yourself, using the Test as a Role and Test as a User features available from the user dropdown in the Global bar. The Home page appears each time a user opens an application. You can create a custom Home page for each role that you create. In fact, you can have a different Home page for each user, depending upon their role. All you need to do is associate a custom Home page with a role. Access the role and go to the User Interface tab. Imagine that you design some special reports specifically for your sales team and you want to make sure that these reports always appear for them. Likewise, you may not want to clutter up your Research department's reports panel with these sales reports. You can solve this conundrum by configuring the reports that appear in the reports panel for each role. Click Set report access, then select the checkbox next to the report that you to make available for this role. Note: If you select a report from this list, access permission to information in these reports does not change. For example, say a manager has a "salary" report that includes confidential information. If users without the proper permissions select this report, they see only those fields that their permissions allow. To limit or grant access to certain fields and tables, you must use the appropriate controls on the Permissions tab (read how). Even though you may want some users to view some of your reports, you don't necessarily want them to edit or change them. When this is the case, you can make sure that users in a particular role are not able to create or customize reports. Select the Hide UI for creating or customizing reports checkbox. If you want to restrict the role even further, you can choose to hide the Personal settings link, which will prevent users in the role from creating personal reports and emails. When you grant a role Basic Access, Quick Base automatically hides the Users button on the Table bar. If you want a role with Basic Access to be able to share and manage users, select the Manage users and share the app checkbox on the Permissions tab (read how). Under Menu & Table Display, select the checkbox next to the item that you want to hide. Note: The Test as another role menu item appears in the user dropdown on the Global bar. You can hide this option by role just as you can for other UI options. You can use this feature to lower the profile of a table or two. Tables in an application appear in the Table bar. If you don't want a table to appear here for a particular role, just let Quick Base know. 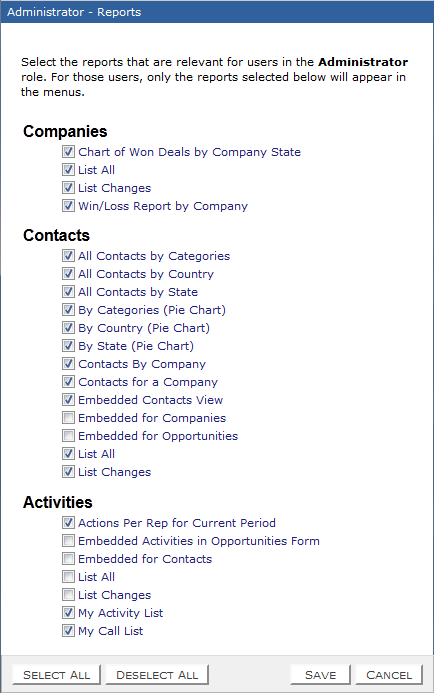 The User Interface tab displays a list of all your application's tables. Note: Hiding a table does not limit permissions to access the table. To limit a user's access to a particular table or its fields, you must set the appropriate controls on the Permissions tab (read how). In the Hide in Table Bar column, click the checkmark for each table that you want to hide. You can also hide Add buttons and links for one or more tables. Note: Hiding Add options from users does not limit their ability to add records. 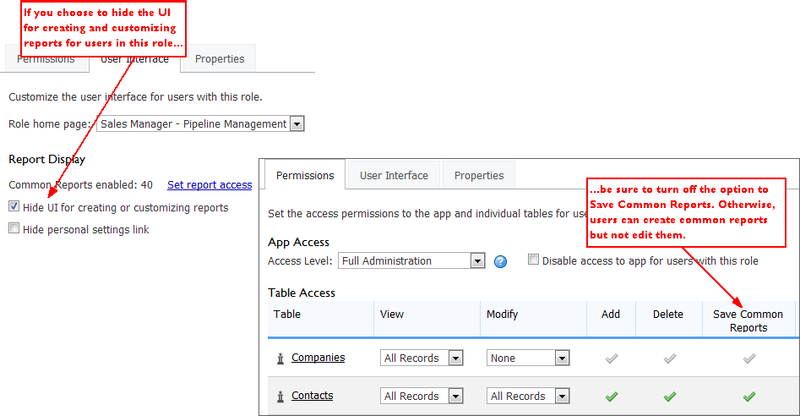 To limit a role's ability to add records, you must set the appropriate controls on the Permissions tab (read how). In the Hide Add Button/Links column, click the checkmark for each table for which you want to hide Add buttons or links. You can limit users ability to import and export data from your app. In the Hide Import/Export Links column, click the checkmark for each table for which you want to hide import/export links. You can hide the link on table reports to Save as a spreadsheet to better control the movement of your data. In the Hide Save as a spreadsheet column, select the checkmark for each table for which you want to hide Email buttons or links. To prohibit users from making sweeping changes in your application, turn off their ability to edit multiple records. When you do so, Quick Base doesn't let a user execute a search & replace operation, import data, or enter grid edit mode. In the Hide Multi-record Options column, click the checkmark for each table for which you want to hide Add buttons or links. You can also hide Email buttons and links for one or more tables. This action will hide the Email link on the Page bar, the More > New notification menu option on records, and the More > New subscription menu option on reports and embedded reports, and in search results. If you are interested in controlling the ways in which Quick Base data may be emailed, you may also be interested in the Hide personal settings link checkbox, which removes the user in the role's ability to create personal email notifications and subscriptions. In the Hide Email Button/Links column, click the checkmark for each table for which you want to hide Email buttons or links. You can also hide Print links for one or more tables. This action will hide the Print this page link on the app Home page, as well as the various options to print records, reports, embedded reports, table Home pages, and search results. In the Hide Print Links column, click the checkmark for each table for which you want to hide Print links.